1. Deviled Eggs: If you love hard boiled eggs, then this would be one of the best Atkins snacks for you. Believe it or not, although this snack is very easy to make, it is also very nutritious. Plus, its extra kick of flavor makes it even more enjoyable than regular hard boiled eggs. 2. 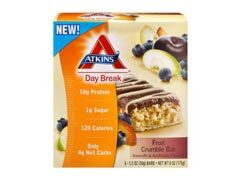 Granola Bar: Atkins bars are very nutritional and can be hidden behind rich chocolate or peanut butter and crunchy granola. The best thing about this particular snack is that it is portable, so you can get the energy that you need to keep going anytime and anywhere. The downside is that although heavily marketed, these bars contain harmful artificial sweeteners that have shown to be toxic to the body, so limit their intake in favor of more natural foods. 3. Celery with home made mayonnaise: Celery with DYI mayo (made from squeezed lemon, organic eggs, extra virgin olive oil, salt and a bit of organic vinegar) is another one of the most preferred Atkins diet snacks out there because it is fast and easy to prepare (when you pre-make your dip the night before). Plus, it is incredibly delicious. 4. Green Olives: Although olives are great snacks to eat during the induction phase, you have to make sure that you focus solely on green olives. Believe it or not, there is actually a big difference between green olives and black olives, so make sure you stick to the former when it comes down to it. And read the labels when purchasing them – avoid the kind with a long shelf life and go for the ones that don’t have preservatives and have a shorter shelf life (they will also taste better!). 5. Avocados: Avocados are great Atkins snacks, too – not just because they are low in carbs, but because they are a source of healthy fats and are known to prevent cancer and help lower the levels of blood cholesterol in the body. When spread over organic rice cakes and sprinkled with unprocessed Celtic salt, it serves as the perfect mini meal on the go! So, there you have it: the top 5 choices for your snacks during the Atkins induction phase. Enjoy them with a cup of weight loss tea and do check out our other article more great ideas for no sugar low carb snacks.